Credit cards are probably the most common reason by far that people find themselves in financial problems, unable to pay off loans, their mortgage or even face bankruptcy. Don't this happen to you. 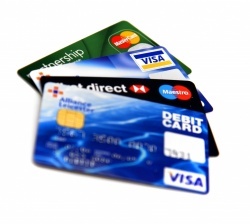 Credit cards are great when used properly, paid down quickly, and assigned low interest rates. They are a necessary evil in today's financial world where everything is electronic, but don't need to be the reason you find yourself in a debt crisis unable to get out from under the weight of your outstanding bills. Take control and use only low interest credit cards and payoff or consolidate your high interest cards, then throw them away for good. Then, switch to using only debit Visa cards that pull directly from your bank account OR use cash. What if you could take all those monthly bills for all your credit cards and make it go away now for less money? Sounds maybe to good to be true, but credit counseling companies make it happen every day with credit card consolidation loans. It's the easiest, quickest, and smartest way to get rid of those high interest credit card payments that are not going away. A credit consolidation loan specialist will look at all your outstanding bills and lines of credit and get them lowered. They will personally contact the credit card companies and negotiate lower amounts on what you owe, up to and over 50% of what you currently are in debt for. More than they will negotiate a loan to pay off all these debts that you can afford at a lower interest rate than your credit cards can offer you. You will not only save money now, you will get closer every month to being free from your credit card debt forever. There are literally thousands of companies out there offering credit counseling and credit card consolidation loans. You must be careful when looking for a credit specialist, and be aware there are many companies out there that are scams and will take your money up front and leave you worse of than where you started. Check with your local Better Business Bureau for a list of reputable credit specialists in your area. Once you find one, don't be afraid to ask questions and make sure you are getting the quality customer service you deserve. Never pay anything up front for an analysis of your financial situation, and avoid every making any type of payments through a tele-check or to a foreign country. These are almost always scams the will solicit you for money before working with you. Choose a credit company with a good reputation and get started now to eliminate those credit cards today.